Inbound, outbound, back-office, language, email and chat support. 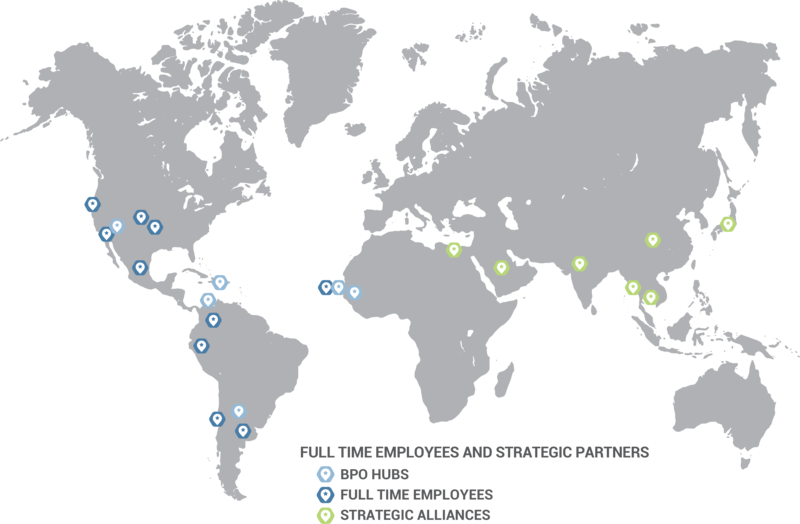 Locations in the U.S., Latin America, Africa and Asia to best suit your business needs. Access to exceptional Spanish-English bilingual speakers and the ability to support over 170 languages. Agents who have outstanding experience servicing U.S. consumers and an excellent understanding of U.S. cultural norms and behavior. Fully redundant data and communications infrastructure. Completely integrated security system, access control and cameras. Integrated UPS and on-site generator systems to ensure 100% uptime. Provides a variety of services, including accounting support, customer service, translations, telephonic andvideo remote interpretation, claims processing, project management for localization and much more. Supports a variety of languages, including English, European Portuguese, Cape Verdean Creole, Brazilian Portuguese, German, Spanish, French, Afrikaans, Zulu, Arabic, Somali, Berber, Amharic, Oromo, Swahili, Hausa, Manding, Fulani, Yoruba & more. Strategically located with only a 5 hr. time zone difference from U.S. Central Time. Offers a politically supportive business climate with very flexible immigration laws, which allows us to recruit the best talent throughout Africa. Provides a wide array of services, including customer service, level 1 and 2 technical help desk, marketing & sales support, database management, telephonic and video interpretation, call scheduling, recruiting, localization project management and more. The English-speaking population is approximately 30%, and they have an excellent understanding of U.S. cultural norms and outstanding experience servicing U.S. consumers. Minimal time zone difference (2 hrs. from CST) and short (2 hr., 10 minute) flight from Miami. Provides a variety of services, including telephonic and video remote interpretation, customer service, general business process outsourcing and more. Offers a highly qualified workforce that is detail-oriented and more cost-effective than many Eastern countries. Key hub for Spanish customer service support for many North American companies. Staffed exclusively with college graduates and post graduates specialized in IT, Business, Finance & Accounting, Project Management & Marketing. High English skill levels for both written and spoken interactions. Primary language capabilities for French, English and several African and Western European languages. An ideal business solution to provide: customer service, technical help desk. finance & accounting, interpretation, translation & project management support. Offers telephonic and video remote interpretation, technical help desk and customer service support. Supports American Sign Language, as well as a variety of languages, such as Spanish, Arabic, Vietnamese, Somali and many more. Provides in-country language compliance support. Ability to support large scale English and Spanish bilingual campaigns with experienced customer service agents.